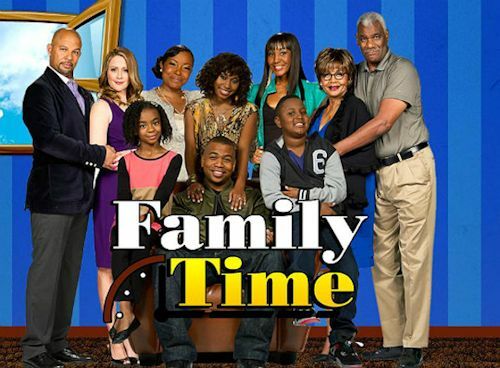 As part of its growing aggressive program strategy, TV One has added the half-hour sitcom Family Time to its Friday night classic comedy block. The half-hour comedy created by Bentley Kyle Evans (The Jamie Foxx Show, Martin, Love That Girl) and produced by Evans and partner Trenten Gumbs, airs Fridays at 7:30PM/ET since earlier this month. The sitcom is a Bounce TV original sitcom and six episodes were produced and aired last summer. No word if the series has been picked-up for a second season and if TV One will take over, but for now TV One is just airing repeats. TV One also airs original episodes of original comedy Belle's, every Friday at 10pm since Feb. 1. It is TV One's newest scripted comedy that centers around widower William "Big Bill" Cooper who owns and operates his family's upscale soul food restaurant and stars Emmy(R) Award-winning actor Keith David (Crash), Elise Neal (All of Us, The Hughley's), Tami Roman, Ella Joyce (Roc) and Miguel Núñez, and introduces young actress Nadja Alaya. The half-hour series is co-created and executive produced by legendary Emmy(R) Award-winning producer Ed. Weinberger (Taxi, The Cosby Show), Belle's co-star Miguel Núñez and Oscar Turner for Gallery Road Productions. The season finale is slated for March 1 and a marathon of all six episodes from the first season will air Saturday, March 2 from 4-7pm. Ans for Love That Girl, TV One has not yet renewed it for a third season. The second season ended last year. As for Family Time, it centers around the life and times of the Stallworths, a working class African American family who get lucky with a scratch-off lottery ticket and makes the leap to middle class status overnight. Starring Omar Gooding and Angel Conwell as parents Anthony and Lisa Stallworth, and Jayla Calhoun and Bentley Kyle Evans, Jr as their children, the Stallworths represent a true-to life African American family working to pursue the American dream. The series follows the family as they move to a middle class community in southern California resulting in classic comedic moments tinged with humorous drama. TV One airs the series Fridays at 7:30pm, followed by a classic TV block of sitcoms from 8-10pm, then Belle's at 10. Stay with us for continued updates on TV One, including Family Time and Belle's, and we might have some classic TV news for TV One later this week...so come on back! Fox's Tuesday adorkable sitcom starring Zooey Deschanel airs Tuesday nights at 9:00pm and we have just watched the next episode that airs tonight (Feb. 19). 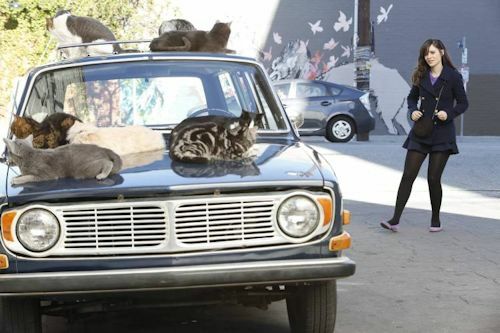 In the episode airing tonight, "Parking Spot," Schmidt (Max Greenfield) discovers a previously unknown, yet highly-coveted parking spot, prompting Jess (Zooey Deschanel) and the roommates to fight over who will get to use it. The situation gets even more complicated when Schmidt discovers that Nick (Jake Johnson) and Jess kissed, as he fears it will trigger the "no nail" clause the guys signed when Jess moved in. Meanwhile, Winston (Lamorne Morris) has a hard time finding an essential item when he gets an impromptu invitation from Daisy (guest star Brenda Song). It's Garage Wars on tonight's all-new episode. The episode begins with Jess and Nick brushing their teeth and talking about how things are not weird between them and they are just roommates. Schmidt finds a hidden parking spot in the garage behind a dumpster. Jess suggests that they share the spot, but everybody else has a different idea. Winston receives a text from Daisy. In a flashback scene, Jess has to deal with outside Dave in her parking spot. Later, Jess tries to flirt with Nick in his hoodie in order to sway his vote. Winston finally arrives at Daisy's apartment, but he has forgotten a condom. Schmidt gives Nick a beer to try and get his vote. 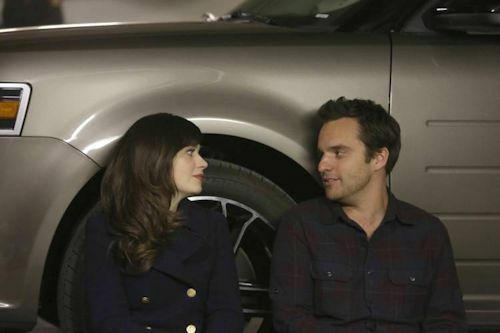 Jess and Nick reveal to Schmidt that they have kissed. Meanwhile, Winston goes to the store, but he doesn't have any money with him. Everybody makes a frantic rush to be the first car parked in the spot to win it. Jess' discovers some feral cats in her current parking spot. Cece talks to Shrivang at her apartment before Winston arrives and asks her for a condom. Schmidt goes to great lengths to stay in the spot. He talks about the "no nail" oath they agreed to when Jess moved in. Winston finally locates a condom, but he has problems finding Daisy's building. The winner of the parking spot is revealed as the episode closes.